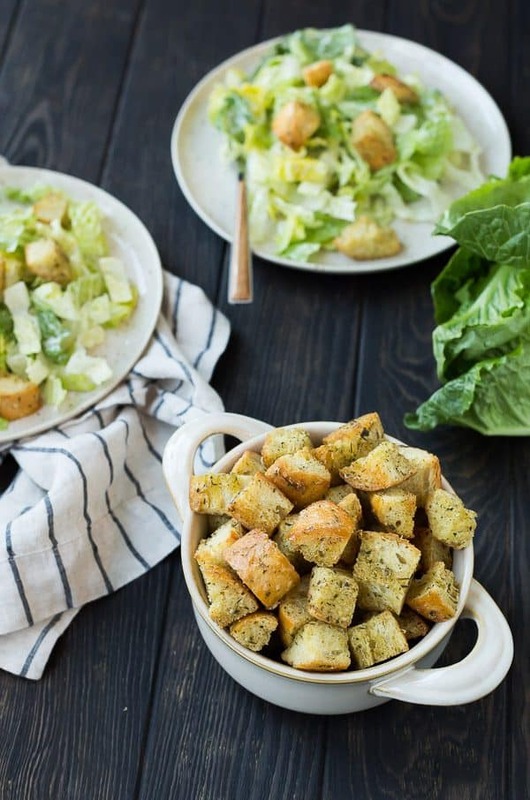 Caesar Croutons are the crowning jewel on a classic Caesar Salad and once you make this homemade version, you’ll find yourself wondering why you ever bought croutons from the store. There is no comparison and they’ll quickly take your Caesar Salad game to the next level. Since you all love these so much (for good reason! ), I’ve gone a little crouton crazy. I compiled a complete guide on how to make croutons, complete with all sorts of variations and ideas for you. 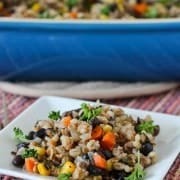 There are even a couple of different cooking methods and a video to help you visualize the process! I also developed a copycat recipe for Ruby Tuesday croutons, because I haven’t been to Ruby Tuesday’s in years and years but I still remember those delicious little cubes of bread. 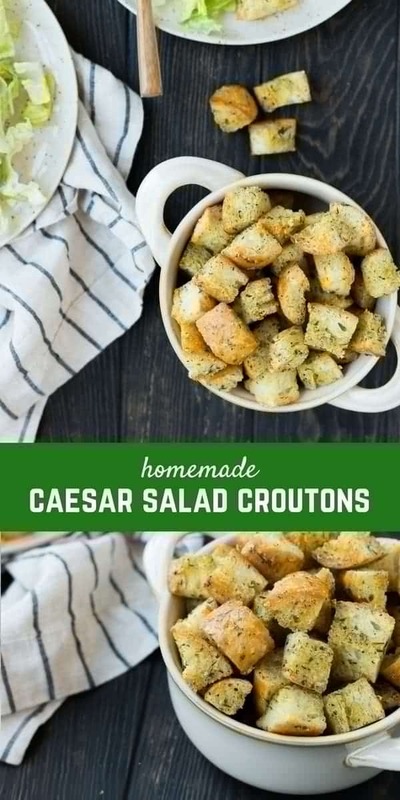 Since we’re riding the crouton train, I thought Caesar croutons also deserved their own feature here. 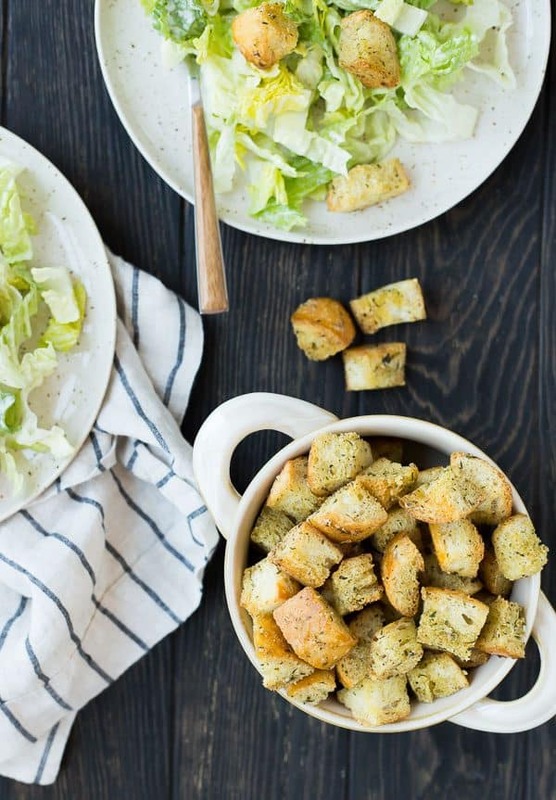 A Caesar salad is not a Caesar salad without the croutons, am I right? So you can either eat those crumbly dry croutons you buy at the store or you can bite into a perfectly crispy chewy crouton that will elevate your salad to a whole new level. There is truly nothing like it for sale at the store, but the good news is that these croutons are super simple to make and they’ll finish baking basically in the time it takes to make the actual salad. 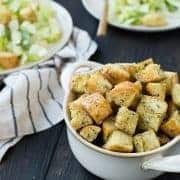 Like all the other croutons, the Caesar croutons are also a great way to use up leftover or stale bread if that exists in your house. 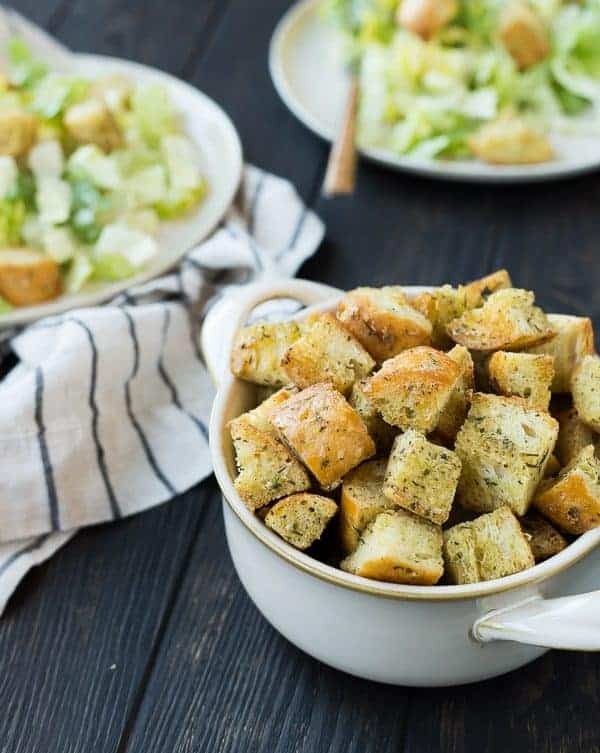 These garlic Parmesan croutons are flaked with herbs and have so much flavor for your perfect Caesar salad. 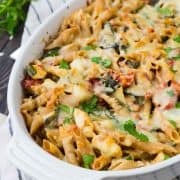 I opted for garlic powder for a more mild flavor but if you’re a huge garlic fan, feel free to mince a couple of cloves and go nuts! Tip: The more stale and dry your bread cubes are, the faster these will brown! If your bread is dry, make sure to keep a close eye on it to keep it from burning. If your bread is quite fresh, plan on slightly increasing baking time. 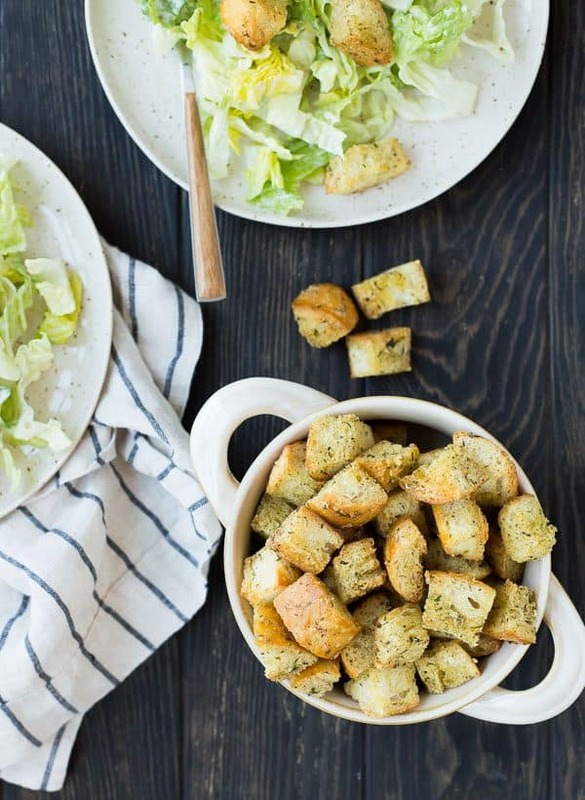 Want to use these croutons but switch it up from the usual chopped romaine? I can’t wait to try this Brussels Sprouts Caesar Salad from A Mindfull Mom, Grilled Caesar Salad from The Little Kitchen, and Roasted Asparagus Caesar Salad from Nutmeg Nanny. PS: Here’s a Homemade Caesar Dressing from Well Plated if you need one – it’s a healthier version and it looks fantastic! 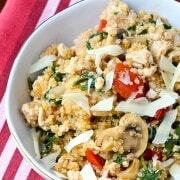 In a large bowl, combine the olive oil, Parmesan cheese, parsley, garlic powder, oregano, salt, pepper, thyme. Add bread cubes and toss to coat all bread cubes with olive oil mixture. Spread the bread cubes into an even layer on a sheet pan. Don’t crowd the pan. Bake for 10 minutes, or until golden brown and crisp, stirring once to ensure even toasting. If you’re using super fresh bread, they’ll take a little longer to become golden brown. If the bread is stale and dry, it may brown faster, so keep an eye on it! Verdict: When I tested this recipe, I actually only ate two of these because I was technically doing a Whole30. 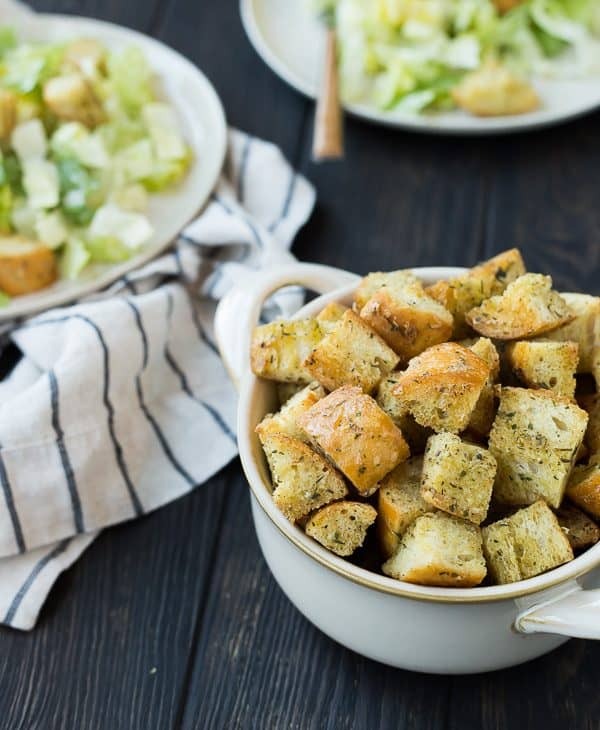 It was SO hard not to eat more – homemade croutons are one of my favorite things and these were some of the best I’ve had! Husband’s take: Luckily Ben came to the rescue and took the bag of these to work with him. I think he snacked on them without putting them on a salad – they’re that good! Changes I would make: None at all! Difficulty: So easy, you guys! 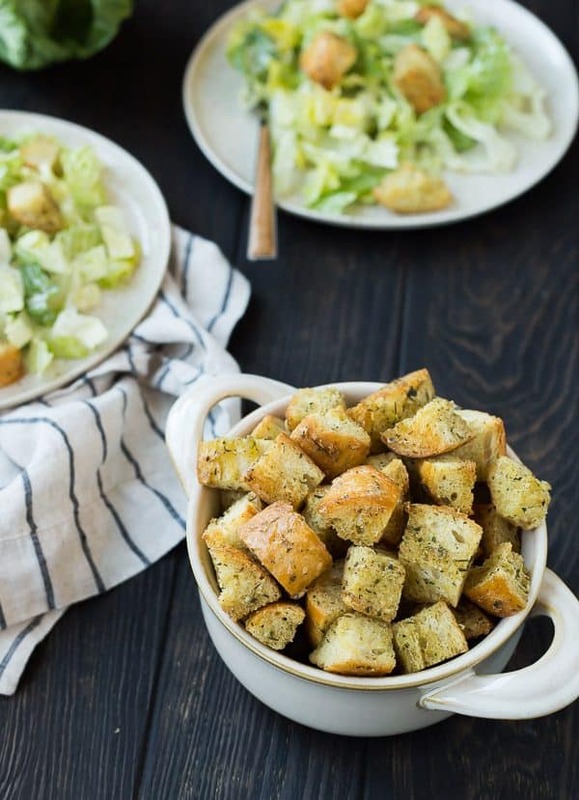 This recipe will change the way you think about croutons! These were fantastic! I used organic white bread from Trader Joe’s, still fresh, and cooked about 10 minutes extra. I also love these in a bowl of tomato soup! I’m so glad you liked these! I bet they are amazing in a bowl of soup! Thanks for taking the time to come back and leave a comment! ooooh! I want to try them in my air fryer! Did you use the same amount of oil? HAHA!! love that you only tried 2–now that is willpower!!! Thanks for the shout out for my brussel sprouts salad! I’ll be making them again soon and this time I’m eating more than two! !